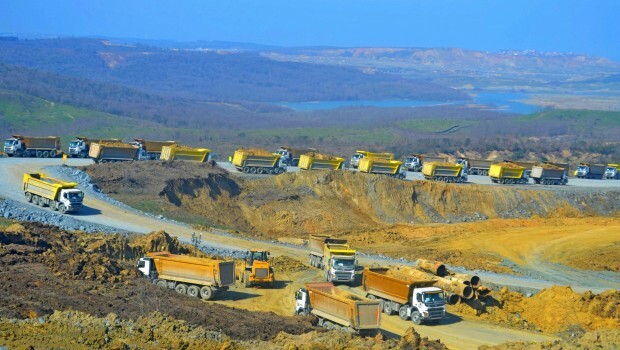 As the Northern Forests Defence, we have been continuously iterating our position that Istanbul’s 3rd airport isn’t a transportation project, but a real estate-construction project that will flood the Northern Forests of Istanbul with cement, which we declared in our announcements and in our 3rd airport report. This fact has also been stated in the environmental assesment report for the project. The gigantic area allocated to the 3rd airport project and also other projects announced by the members of the consortium for the area, are strong evidence of this. As a matter of fact, the 3rd airport project will be showcased under the name of “Airport City” in the world trade show MIPIM 2017, to be held in Cannes between 14-17 March. The citizens of this country are ignorant of the decisions that will affect the future of the city and their children, as global capital and real estate / construction companies continue their plunder projects in the Northern Forests of Istanbul, the lungs of Istanbul. As citizens of this country we mostly don’t hear about the details nor the locations of such projects, as well as the 3rd airport project, however esteemed architects (!) and global actors, who find it difficult to embark locally on such projects that devastate nature and the environment, and violate the right to live, are in command of all details, since they are very busy preparing project after project for the Northern Forests. One of these companies is a Dutch real estate-construction company, whose application story you will read below. This company, name and involved project unknown, applied to the well-known credit company Atradius Dutch State Business (ADSB) -which operates on behalf of the Dutch government- in 2016 in order to apply for export credit support for a project related to the Istanbul New Airport Project. Then ADSB contacted NFD in October to obtain information related to the 3rd airport project. 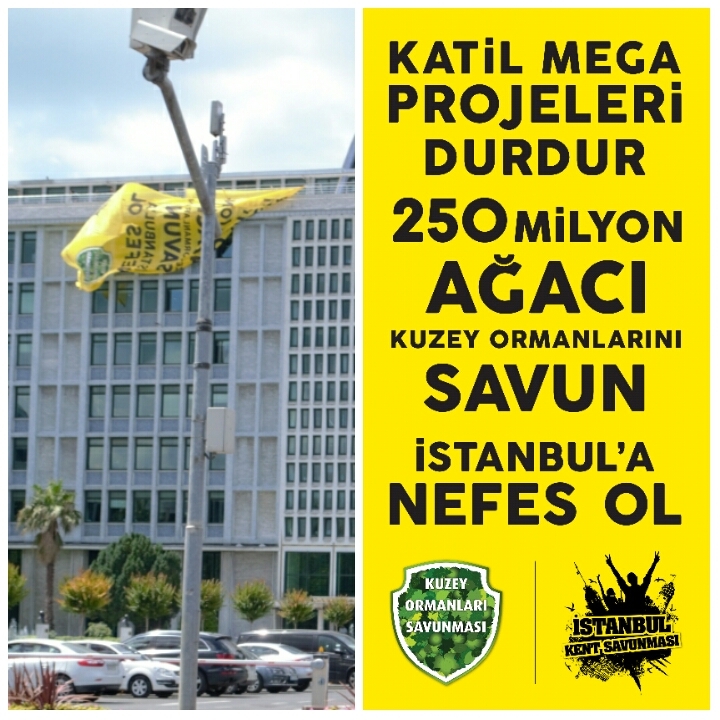 When we met with the ADSB officials in Istanbul, we conveyed our position that the 3rd airport would be death of Istanbul and the only acceptable solution would be the cancellation of the project and detailed the permanent damage this project will leave on the local ecosystem, the workplace murders committed in the project, and the lack of transparency. And last month we received the good news: The company, probably due to refusal of its credit application, had announced its withdrawal from the project. ADSB, due to its ethics code, didn’t share the name of the company, nor the character or the location of project, with NFD. As we announce this positive development, we are also sharing the 6 February 2017 dated press announcement of the Dutch STK Both ENDS, who linked ADSB and NFD – there is additional information about the process in this announcement. Turkey is building Istanbul’s third and the world’s biggest airport in the Northern Forest area on the outskirts of the city. The project is strongly opposed by local communities and NGO’s, as it destroys the environment and violates basic human and local community rights. On January 27th, Atradius Dutch State Business (ADSB), the Dutch export credit agency, announced that a Dutch company withdrew its application for export credit support for this controversial mega-project. Local communities, supported by the Turkish civil society organisation Northern Forest Defense (NFD), and their Dutch partner organisations XminY and Both ENDS, are pleased with this development. They hope that the withdrawal will contribute to address public concerns surrounding this mega infrastructure project. In August 2016 Atradius DSB, which operates on behalf of the Dutch government, announced on its website that it was considering an application for export credit support for the Istanbul New Airport Project. This project was classified as potentially having high social and environmental risks. Both ENDS shared this information with NFD, which then discussed its concerns about the project with representatives of Atradius DSB during their visit to Istanbul in October 2016. Another critical issue NFD points out is the lack of safety measures. Nearly 100 workers have died due to accidents, many of them truck drivers. Thousands of trucks move sand, cement and rubble in and out of the project area day and night. Moreover, NFD raises major questions about both airworthiness (due to meteorological conditions, migratory birds, soil structure) and financial risks of the project. Examining the financial stability of Turkey as a whole and the airport project specifically, the NFD report argues that the airport is not likely to make significant revenues in the near future. “Although the identity of the Dutch company nor the reason for the applications’ withdrawal were ever disclosed, we assume that NFD’s efforts of sharing concerns with ADSB helped trigger the Dutch exporter to reconsider its involvement in the airport project”, says Niels Hazekamp of Both ENDS. ”Hopefully, the withdrawal of this application for an export credit insurance will motivate other companies to re-evaluate their role in the project as well”. In order to show the damage inflicted by the 3rd Airport and the kind of future awaiting Istanbul, a group of Northern Forests Defense (KOS) activists picniced at Yeniköy, one of the villages in the 3rd Airport area. The location of the picnic was Yenikoy meadows. A large portion of the area which used to be as green as grass had been destroyed for the construction of the Airport in less than 2 years. As for husbandry, one of the main economic resources of the village, it had almost come to a halt. 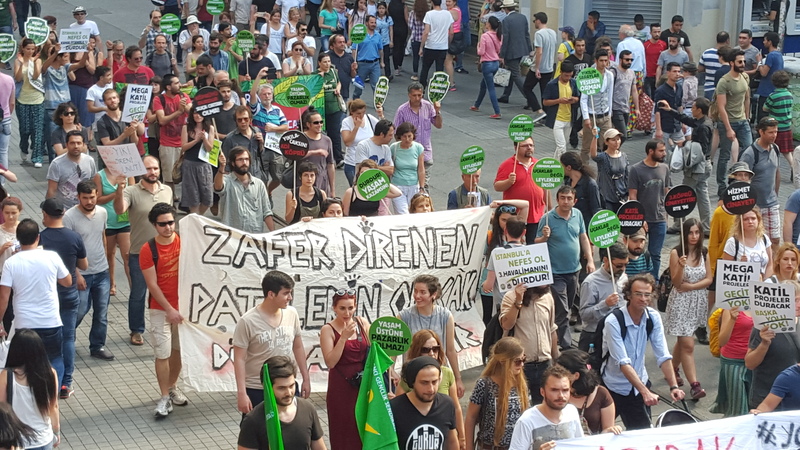 In their written statement about the picnic, KOS activists expressed that in order to attain a liveable Istanbul, Istanbulites need to close ranks and confront all projects that set eye on Northern Forests, first and foremost against the 3rd Airport. It will destroy millions of trees together with all living beings that live dependent on the regional ecosystem. Villagers who make their livelihood from the area will be displaced. The airport project area 90% of which comprises lakes and forests will be turned into concrete through the creation of new cities and other construction projects. Istanbul’s already dense population will be multiplied as a result. New urban heat islands will be created in the area due to deforestation and concretion. Winds that blow from the North and breath life into Istanbul will be blocked. It will speed up the climate change we have been passing through currently by contributing to the acceleration of carbon emissions generated by the aviation sector. 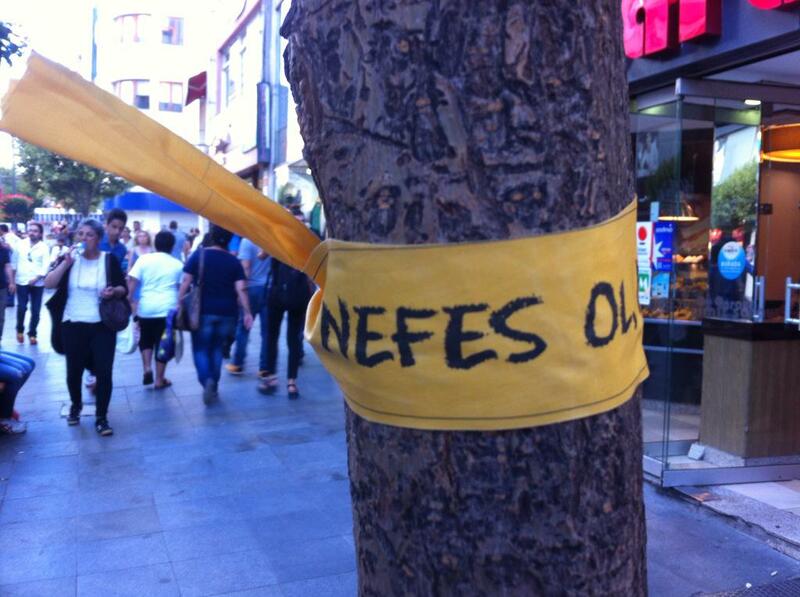 It will tear apart Istanbul and Northern Forests that have existed together since archaic times from each other. Istanbul will turn into an unsustainable, unliveable dystopia. Northern Forests have been the source of life to all living creatures for thousands of years. In the Northern Forests, with their ancient sand dunes, rich meadows and beautiful ponds in which fish lived, they say that once upon a time there used to be hidden heavens where only migratory birds could land. And one day, the human, one of the guests of this hidden heaven, fell under the illusion that he could be the master of all creatures. He fattened as he consumed; he consumed as he fattened. As the monuments of arrogance he constructed mushroomed in cities, cities sprawled and started occupying hither and thither. The place where we came today for the picnic used to intermingle with Northern Forests once but now falls within the area of the 3rd Airport which is being propagated through the construction of a falsehood of ‘development’. The picnic area which used to be as green as grass till two years ago has now been contaminated by human hands; ravaged by construction machines. Then, what kind of a future awaits us if the 3rd Airport project is completed? The project will destroy millions of trees together with all living beings that live dependent on the regional ecosystem. Villagers who make their livelihood from the area will be displaced. The airport project area 90% of which comprises lakes and forests will turn into concrete through the creation of new cities and other construction projects. Istanbul’s already dense population will be multiplied as a result. The project will speed up the climate change we have been passing through currently by contributing to the acceleration of carbon emissions generated by the aviation sector. If we do not struggle against the eco-cide projects planned in the Northern Forests, and first and foremost against the 3rd Airport, our picnic as the representation of dystopia may become the future of Istanbul. Wishing that all defenders of life close ranks in order to resist against the 3rd Airport project and make our picnic which presented a cross-section from the future of Istanbul NOT possible. GAAM has published a video showing the ecocide underway for Istanbul’s third airport – an ecocide megaproject. The project site is north of the city on the Black Sea coast. A vast area of forests, lakes, farmland and coastline is being systematically destroyed as the site is prepared for construction. The plan is to build an aerotropolis covering 76 square kilometres. Trees are being felled, lakes filled in and land reclamation damages coastal ecosystems. The aerotropolis plan is linked with other destructive megaprojects including a third bridge across the Bosphorus Strait. Resistance against the megaprojects is led by Kuzey Ormanları Savunması (Northern Forest Defence). The video was taken on a visit to the site on 7th May 2016, photos can be viewed on Fickr. 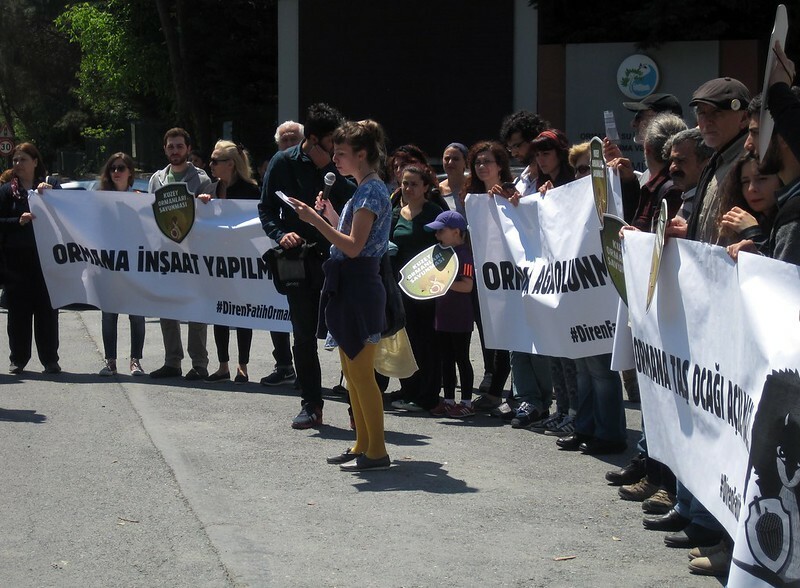 Earlier that day Kuzey Ormanları Savunması held a protest outside the forest directorate. 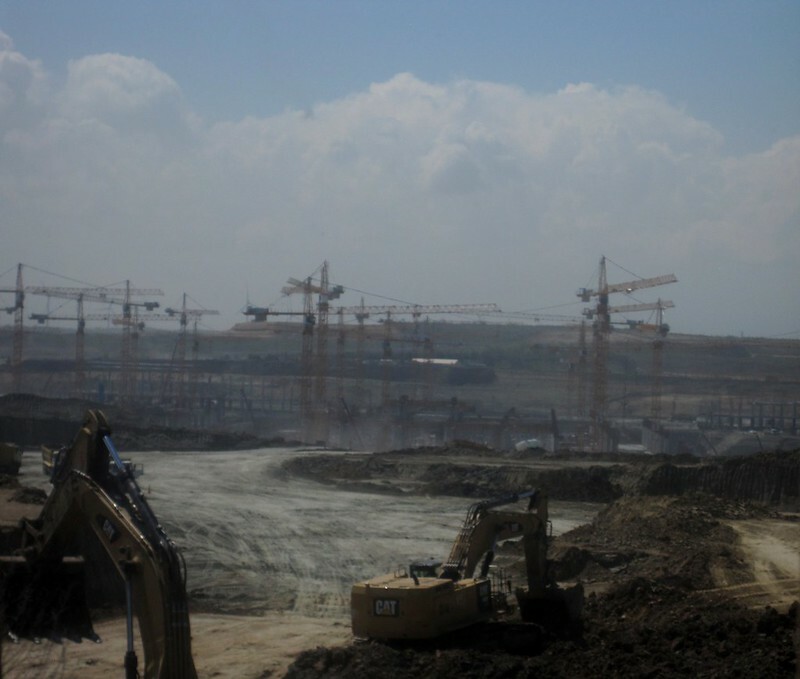 Industry videos of construction of Istanbul’s third airport are available online – giving an indication of the severity and extent of the destruction of ecosystems. The video below, made by Caterpillar shows bulldozing underway. This video of construction of the airport – on land that used to be forest, lakes and farmland – was filmed from above. In March, Kuzey Ormanları Savunması​ (the ‘North Forest Defence’) which campaigns to protect the forests to the north of Istanbul from industrialization and urbanization, published a 100 page comprehensive report into Istanbul’s third airport, currently under construction. Entitled The Third Airport Project: Vis-a-Vis Life, Nature, Environment, People and Law, this report has been translated into English. It exposes the ecological destruction of the project, and examines the drive for economic growth and corporate profits that is the real reason it is being so relentlessly pursued by the government and firms that stand to benefit. The site is gigantic, over 76 square kilometres. About 80 per cent of this area is forested, the remainder consists of 70 large and small lakes, meadows, farmland and coastline. All are being destroyed as airport construction progresses. The reason for the gigantic site is that the plan is not for an airport. 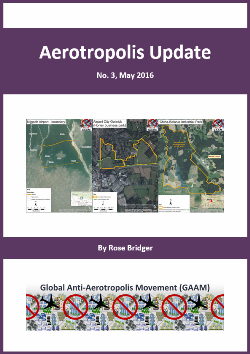 Land is being expropriated for an ‘aerotropolis’, an airport surrounded by commercial development that is designed to be aviation dependent and support growth of the airport. Istanbul’s last large area of green space is being sacrificed for a vast urbanisation incorporating the world’s biggest duty-free shopping centre, hotels, a convention centre, sports centre, business space, a clinic and other facilities. Ostensibly, the land is allocated for an airport with the incredibly ambitious goal of handling 90 million passengers annually, ultimately becoming the world’s busiest airport with 150 million passengers passing through. But even if the airport does indeed grow to handle this number of passengers, an eventuality regarded as unlikely within the aviation industry as well as by its critics, there will be plenty of space for commercial activity. North Forest Defence estimates the area surplus to requirements for aeronautical activities at 57 square kilometres. This is illustrated by comparison with the world’s busiest passenger airport, Atlanta in the USA, which, with a a far smaller land area of 1,625 hectares, handles about 95 million passengers per year. Preparation of the site for construction commenced on approval of an Environmental Impact Analysis (EIA) that North Forest Defence’s work exposes as utterly inadequate, full of serious omissions and trivialising the impacts of the project. Lakes are described as ‘ponds’, the number of species at risk is under-reported and the bizarre claim is made that, of the 2.5 million trees earmarked for felling, over 1.8 million would be moved to another place, a mass replanting that is technically impossible. The reality is that the habitat of animal and plant species is being obliterated. Endangered bird species whose habitat is imperilled include the greater spotted eagle and the pygmy cormorant. Istanbul’s northern forests are one of the world’s major bird migration routes with hundreds of thousands flying over every spring and autumn. This means that the airport will endanger human life as well as birds, as there will be a considerably higher flight safety risk from bird strikes – collisions between birds and aircraft that can cause fatal air accidents. 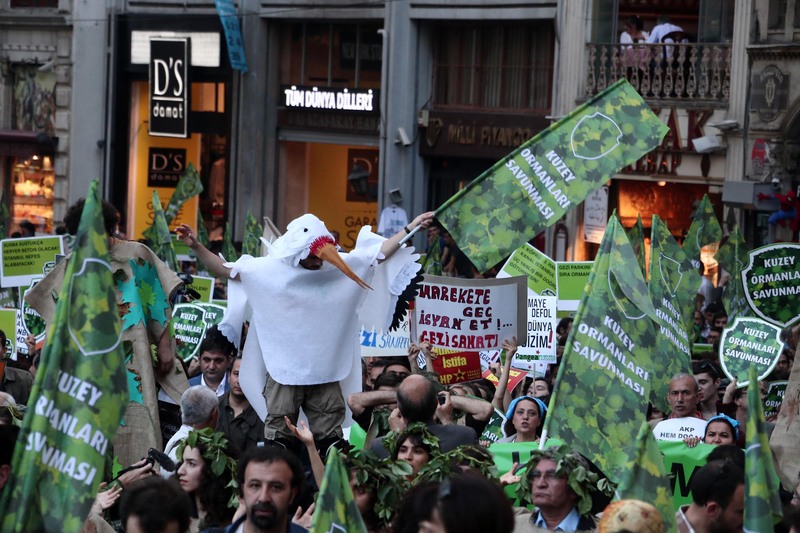 Istanbul’s third airport has proceeded in the face of vigorous opposition from a broad coalition of environmental, community and civil organisations, plus professional associations of engineers, architects, scientists and economists. There have been endless campaign meetings and protests, in the centre of Istanbul and in villages affected by the project. The two photos below are of the protest to mark the groundbreaking ceremony for the airport, on 7th June 2014. A slideshow with more photos of this lively protest can be viewed here. North Forest Defence’s report is also a powerful critique of the financing of the airport, and the economic implications. The tender to construct the airport and operate it for 25 years, the biggest in the history of Turkey, was awarded to a consortium of five firms, all with close ties to the government. These firms stand to profit from operating the airport, regardless of the actual level of traffic, because of a state guarantee of liabilities that may be incurred. The consortium’s economic benefit from the airport is also assured because of revenue guarantee of €6.3 billion over 12 years, from a fee levied on the projected 342 million international passengers over this period. There is a precedent for state payment to airport operators when the projected number of passengers fail to materialise; €27 million has been paid to reimburse the operator of three of Turkeys’ airports to compensate for a shortfall. Treasury guarantees mean that the economic risks of the project fall onto citizens. Every Turkish citizen will incur debt due to the cost of the project, which has already escalated from $16 billion to $20 billion. The airport project is part of a construction and real estate speculation frenzy that serves as Turkey’s main economic stimulus, keeping up a flow of ‘hot money’ – international capital seeking short term profits from interest rate differences and anticipated shifts in currency exchange rates – that buoys up capital markets and keeps the plates spinning. The campaign to stop construction of Istanbul’s third airport is bolstered by an extraordinary visual record of the ecological destruction that is underway – photographs and videos. It is highly unusual for a megaproject to be documented in this way and it is extremely effective in raising the alarm over the scale and severity of the ecocide that is happening. The site is crawling with hundreds of trucks excavating and dumping earth, the level of infill required to raise and level the site is estimated at 2.5 billion square metres, and compacting the soil is on the swampy site is proving problematic. A video shows destruction of forests and meadows and filled in lakes, swathes of bare earth being worked by bulldozers, and piles of felled trees. There is nowhere left for the wild animals or for farmers to tend their sheep. The 3rd Airport Project in İstanbul Against Life, Nature, Environment, Humanity and Law from Kuzey Ormanları Savunması . Video of storks, one of the 300 species of birds whose habitat is being destroyed for Istanbul’s third airport, flying around bewildered and traumatised in the immediate aftermath of their habitat being bulldozed. 3. havalimanı leylek travma from Kuzey Ormanları Savunması . This video, published in May 2015, shows the impact of airport construction on the coastal village of Yenikoy. It begins with a farmer explaining the ‘airport city’ plans, shows the farmland that is at risk as bulldozers move ever closer, then reveals the destruction of forest, lakes, farmland and coastline that is already underway. İstanbul 3rd Airport Construction – Yeniköy – May 2015 (Eng Subtitled) from Imre Azem. Istanbul’s third airport is integrated with other ecologically destructive megaprojects – a multi-lane third bridge over the Bosphorus Strait and a canal running alongside it. Highways to provide surface access mean the loss of yet more green space. All these projects open up the virgin forests for further plunder and feed each others growth. Campaigners have stepped up their efforts to tackle these megaprojects as a package. North Forest Defence has joined forces with Istanbul Kent Suvanmasi (Istanbul City Defence) and on 5th July 2015 a new campaign was launched. The slogan is: ‘Stop the Killer Projects! Be the Breath of Istanbul‘. The forests north of Istanbul are depicted as the lungs of the city, providing oxygen for people and all life to breathe. As well as resisting the megaprojects the campaign is about envisioning and creating a future city which lives in harmony with nature rather than destroying it, taking forward the optimism that concludes North Forest Defence’s report into the third airport, the conviction that ‘it is in our hands to write another story’. The third airport is linked with other forest destroying megaprojects – a third bridge over the Bosphorus, a motorway and a canal linking the Black Sea with the Sea of Marmara. On 26th March Kuzey Ormanları Savunması​ held a press conference during which architect Mücella Yapıcı warned of irreversible ecological damage from the airport and other megaprojects, and announced that several business chambers, including the Chamber of Architects and the Chamber of Engineers, have united to open a court case relating to two Environmental Impact Reports in court. Both reports, prepared for investors, emphasised serious ecological destruction, with Yapıcı stating ‘This is the massacre of Istanbul. We cannot just sit here silently and allow this’. At the press conference, Kuzey Ormanları Savunması​ presented its latest report. Entitled ‘Life, Nature, Environment, Humanity and the Law against the Third Airport Project‘ (article in Turkish) it explains that the megaprojects – the bridge, highway, canal and airport – are interconnected and designed to feed each others’ growth. The report also reveals that the new airport is not just an airport; it is a plan for an aerotropolis (a city built around an airport), on a site of over 76 square kilometres. Even if the new airport reaches its stated goal of 150 million passengers per year (which would make it the world’s busiest airport), the land area far exceeds that which would be required for aeronautical operations. Currently, Atlanta Airport in the US is the world’s busiest passenger airport, handling 95 million passengers per year, covering a site of 16.25 square kilometres. The aerotropolis plan is designed to trigger development on land surrounding it including business, cultural and sports complexes, sprawling over the last remaining pristine natural areas of the area. Negative environmental impacts from felling of forests include loss of climate regulation through oxygen production and carbon sequestration. There are serious concerns over the concreting over of lakes which is a threat to Istanbul’s water supply and the loss of habitat hosting an abundance of wildlife such as wolves, insects and at least 160 species of birds.